TravelVision: Time is infinite, but your time is Not! Time is infinite, but your time is Not! Time management has never been my strong suit. I'm the type of personality that spends way too much time on any one project. Whether it's creating a marketing campaign, blogging, or trimming the hedges I keep thinking with just one more snip it will be perfect. It's far worse if it's something I really enjoy, but I had no idea how bad it could get until I became the business owner. After all it's your baby, your responsibility – Right?! Besides, you're not an hourly employee. You can take whatever time "you need" to get it done. If this sound familiar you need to stick around. First, I need to give credit where credit is due. I recently read a post by my new favorite business coach, Marie Forleo, which served as a big reminder. She spoke of how prevalent the time management problem is, so I'm revisiting the issue. When Marie was faced with just 4 hours to prepare a presentation for Tony Robbins she realized she had only one choice – Get It Done! Marie explains, "You see, I normally take waaay more time to produce webinar content." (hmmmm, sounds familiar?) "I’m a bit of a perfectionist so often I spend hours, over several days, refining my content before I feel it’s ready to present." Her point, "Most of us entrepreneurs have a habit of working on stuff WAY longer than we need to." However, when faced with an important task and an unyielding deadline we usually get it done, ergo we are capable! 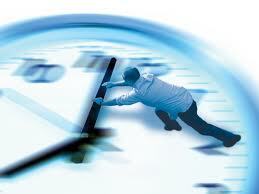 You MUST self-impose time limits, that is to say, break down your day into manageable time increments. Begin by creating lists of everything you need to accomplish monthly, weekly, and daily. Include things that you aren't yet doing, but feel you need to add. Then, prioritize the lists. Lastly, assign each task a time allotment. Assigning time to both the simple and complex tasks is necessary for you to figure out where you're going wrong with your time management. For example, a daily trip to the bank, if it's 30 minutes round trip and 15 minutes processing, is a 45 minute daily task - simple. Some things though, like social media, may not be as simple to define. Figure the tasks your certain of first, then assign the remainder a reasonable amount of time. Keep foremost in your mind, if you're allotting 2 hours to social media (even if it is fun) instead of 45 minute you actually have available you're already at least an hour overtime. Ask yourself if 2 hours is really necessary or if you might be going overboard. Remember, there are only 24 hrs in a day and no matter how creative you are, you can't make 24 hours turn into 48. Artists have a saying, If you keep going over and over the paint you'll muddy your work. It's important to know when to put the brush down. The same can be said here. You can muddy a project if you keep going over and over it and other important task will be continually sacrificed. It's time to examine your lists. Assess your time allotments for reasonable expectations. A good rule of thumb is to assign times based on the amount of time you would allow an hourly employee to accomplish the same. If your list exceeds waking hours, you have a real problem. You either need to edit or delegate, which brings us to my next point – the control freak. Another form of time management sabotage. Are you one of those bosses with the attitude, If I want it done right I have to do it myself? Are you taking over every project, or micromanaging your staff? Either way, again, you are the problem. When everything has to flow through you, you bottleneck your business. The simple solution to this is let your staff do their jobs! Delegate and instruct, then if they still don't meet your expectations, either retrain them or replace them. The bottleneck business manager cripples business. If you've allotted 45 minutes a day for banking and 45 minutes a day for social media postings and by the time you add up your daily tasks you're 45 minutes over. It is absolutely necessary for you to delegate the responsibility of one of those tasks to someone else. Many business owners find themselves in this predicament. Even highly successful entrepreneurs, like Marie. The first and most important step you can take is – stop beating yourself up! Great discipline doesn't happen overnight and sometimes, even with the best intentions, things get away from us. We're not bad business people or procrastinators or inept. On the contrary, we're actually well intended, hard working business professionals. Acknowledge your weaknesses and your strengths will allow you to reset your focus. We all need a little clarity from time to time. 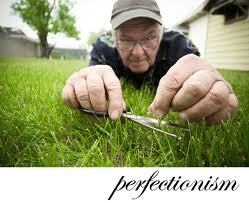 Recognize that you may need to back off on the perfectionism in order to get more things done. Finally, neither of these problem will go away if you simply acknowledging and address them once. Perfectionism is always going to gnaw at you, which is precisely why we're discussing it again. It is part of what makes you great, however it takes discipline to keep it under reasonable control. You will need to monitor your behavior until it becomes your norm. Having realistic time constraints, delegation and accountability for yourself and your staff will create a positive, productive business environment. Start implementing the necessary changes and you will become an even better business owner. Know when to put your brush down.